Mt Eden Rd is one of Auckland’s busiest bus routes. There are around 2.3 million trips a year on the services that use it and over 2 million of those are on weekdays – this also doesn’t include the Outer Link or Skybus. The route was one of the earliest corridors to get bus lanes, however, back when it was installed not all bus lanes were created equal. One stretch of bus lane, southbound just before Mt Eden village is one of the most useless in the city, only operating between 4:30 and 5:30pm. Perfectly timed to end just the after work rush comes through. Apparently this was a compromise to placate local business concerns about the impact on parking in the village. We’ve wanted to see this bus lane fixed for years and finally Auckland Transport are planning to change this and make a number of other improvements. They’re currently consulting on the changes and it’s important they get support. Overall there are four changes they’re looking to make. Increase bus lane and clearway operating hours along Mt Eden Road. 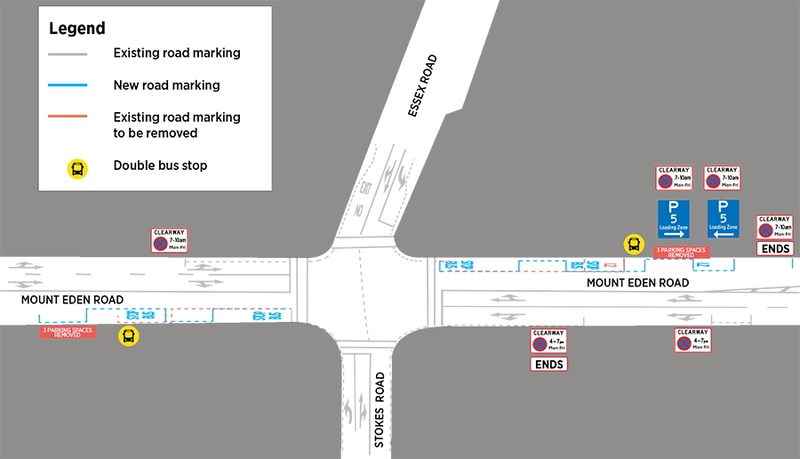 Change bus stop layouts in Mt Eden Village. Extend bus lanes along Mt Eden Road, between Plunket Road (south of Balmoral Road) and Kingsview Road. Change parking restrictions in Mt Eden Village. This is a big improvement, especially in the PM peak. The current shorter hours result in some people changing when they travel simply so they can have a reliable journey and not risk getting held up in traffic. This can help to create crowding on some services. Along with the increased operational hours, AT plan to plug one of the key bus lane gaps. Currently the northbound bus lanes stop either side of Balmoral Rd subjecting buses to congestion and delays. AT plan to fix that, as shown below. To implement this it will effect right turns to Pencarrow Ave which is bound to get some feedback. AT say doing this will also improve flow for general traffic. As part of the changes, AT want to extend the length of bus stops in the village to be able to cater for two buses at the same time. The longer bus stops will require the removal of three carparks on each side, six in total and is already looking to be the most controversial aspect of the changes. The local business association want the bus stops pushed out of the village centre all together. Mt Eden Village is a busy, vibrant crossroad boasting over 1.42 million transactions each year and with a strong focus on food and beverage options. Many food businesses offer street-side dining, a not-so-pleasant experience when diesel buses dominate the village. Hundreds of pedestrians pass through the village each day, many of these, our precious school children. Bus schedules are fickle and the over-flowing of buses across our main intersection creates a dangerous environment for all! We propose that the bus stops are completely relocated to just the other side of Valley Road. Even if this was true, and local business associations have a tendency to make statements like this up, my guess is that people don’t bother with shopping because it’s been such an ordeal to get through the village centre due to the lack of bus priority. By the time they’re through the village just want to get home and not have their bus battle traffic again. This is an issue that would be resolved by improving bus lanes. In reality of course, buses done right are pedestrian fountains and would be delivering large numbers of people right the door of those shops. AT are proposing make a number of changes to parking in the area which they say follows a two year study of parking in the area. I won’t list all the details as they’re on ATs website but one interesting thing I noted was including some carshare only carparking. The text about the parking study also highlights the problem with the business association’s complaints about removing parking for bus stops. Over the last two years, we carried out a comprehensive parking study in and around Mt Eden Village in consultation with Mt Eden Village Inc (local business association). The study showed that overall parking availability isn’t the major issue in the area. However, it highlighted that several streets within the village experience high demand for parking. Approximately 90% of parking spaces in these streets are occupied during peak times. The study also found that on average vehicles are parked for one hour in the village. This suggests that the existing 30 minutes time limit often doesn’t meet visitors’ parking needs. With the bus stop changes already getting push back from businesses, it’s important that AT don’t back down or delay making improvements to this key bus corridor. Submissions are open until Wednesday 28 February. So still no bus priority through the town centre? Surely that is a major bottleneck. We need to look at what is being proposed by way of priority for Dom Rd LRT and apply it to other high use corridors. Just because it is buses there is no reason they shouldn’t get similar priority. Maybe they need to think outside the square a bit. For example if traffic turning right into stokes road was instead made to turn left into Ngauruhoe then through the current car park onto Essex then straight ahead, there would not need to be a right turn lane, general traffic could use the right lane. and northbound buses could have a lane to themselves. Thanks Matt. If they’re making any changes to bus lanes near the Balmoral Rd – Mt Eden Rd corner, I wish they would also fix the placement of the bus stops. 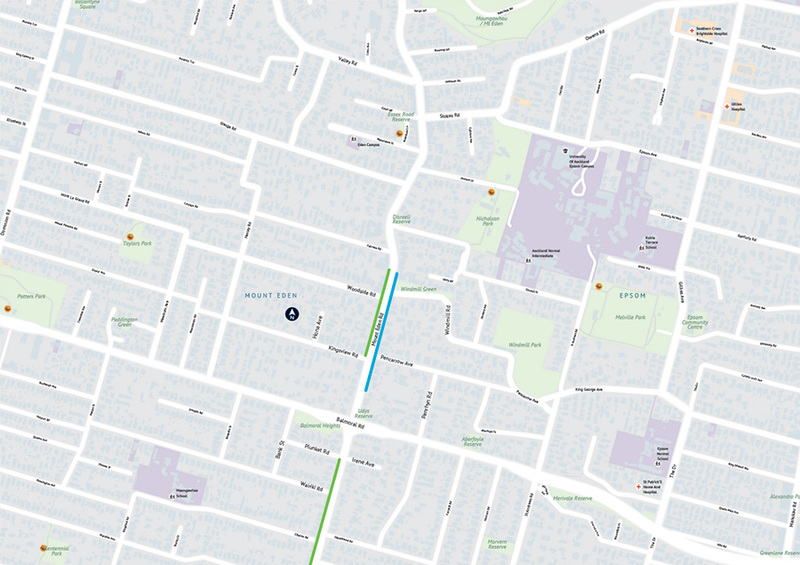 The bus stops on Balmoral Rd, east of the intersection, and all those on Mt Eden Rd, are too far from the intersection. This is a node where bus routes intersect, and where the Outer Link bus turns. People needing to transfer between buses have a too-long walk. Decision-making about taking the Outer Link or the 007 is also fraught, with the bus stops of one being too far from the intersection, and the frequency of the other being insufficient, all made worse by the pedestrian-unfriendly traffic light phasing. I wonder what the breakdown of the 2.3million trips is? My guess is 2 million from the Mt Eden shops fare boundary and 0.3million on the rest of the route. What they need is light rail through Mount Eden! I suggest we insist on trams / light rail / the coolest type of PT on the planet on Dominion Road, Manukau Road, and New North Road. Leave Mount Eden and Sandringham for the boring imaginationless car types. I would prefer trams down all these routes but apparently compromise has to be reached with the selfish, planet destroying private motor vehicle operators. In the meantime enjoy these extended bus lane hours. Such generosity from AT. Matthew, I love your idea for light rail through all those locations. Do you believe that once Westfield doubles the amount of mall parking (to 2700 spaces) for the Broadway mall that any type of vehicle will be able to use that road at anything faster than walking pace? Broadway is about 6 lanes wide, heaps of room for an exclusive PT Corridor. The fact it is allowed to function as it does currently with the amount of buses it sees is really outrageous. They used to be called trams and Mt Eden Road was a key route, and didn’t affect parking because they ran, and stopped, down the middle of the road, just like they still do in Melbourne. I wonder if a similar system could be used for buses with island stops in the middle of the road next to pedestrian crossings controlled by traffic lights. Could be worth a look.. There was room for them before. What happens when there’s a prang between some dopey driver and light rail? Does the whole line come to a halt and major delays occur? Yes. That’s what happens in other cities where trams mix with traffic. The quick incidents can be cleared up within the hour, but even that usually means an hour with no trams running. More serious incidents can take much longer to clear. Yes. That’s what happens in other cities where trams mix with traffic. The quick incidents can be cleared up within the hour, but that usually means an hour with no trams running. More serious incidents can take much longer to clear. I hope this proposal is implemented. 1) No more bus bunching post-Balmoral intersection because FINALLY THERE ARE CONTINUOUS BUS LANES! 2) Get rid of all the people who drive to Mt Eden Village, park all day for free, and bus to the city. FINALLY THE CARPARKS ARE ACTUALLY FOR PEOPLE WHO USE THE SHOPS! “They’re currently consulting on the changes” – why? Just change the bloody signs and put down some green paint and be done with it. Of course the shop owners are going to say they don’t want bus lanes and bus stops – well bad luck. If you want your own car park, buy some land, don’t expect exclusive use of public land. I agree that shops should provide parking if it’s so incredibly important. Important enough to cause a constant traffic jam hundreds of metres back down Mt Eden Rd (on a good day)? That’s trading off a lot of people’s time against a few people’s convenience. I also loved this sentence “buses done right are pedestrian fountains” and don’t know why local business associations don’t understand it. How about these for suggestions: run the bus lanes continuously from Mt Albert Road to Symonds Street. Make them 24/7 bus lanes. Run the services 24/7. Make them a bit more expensive in the wee small hours to cover the cost of security guards on board. That southbound bus lane has some use, it makes for a great cycle lane! Ideally at night we see half hour frequencies. 24/7 bus lanes is a bit stupid – never seen Mt Eden Rd congested at 2am on Thursday morning. Same goes with bus lanes on Anzac Ave. Once it was 9pm Saturday night and I drove in that bus lane and there were no other cars. Bus was behind me and honked relentlessly. Absolute no need. But then one traffic lane each way is still plenty isn’t it? What about people who need to park on the street through the night? Are you going to tow them when they’re not causing any congestion? I agree, there was absolutely no need for you to be in the bus lane. Actually there was. I needed to use the bus lane to turn left. There was no need for the bus driver to be so upset. So if there is no congestion at that time, there is no need for cars to drive in bus lanes, so the bus lane is no issue? Plenty of room for everyone? Same with the ANZAC example. There were no other cars so presumably plenty of room in the general lanes and the bus lane was holding up nobody. But why designate the space to be a bus lane when it could be more effectively used as on street parking? I agree with making a bus lane during peak hours so no one parks there and then buses have a clear way, but at night time when there is no congestion and everything is free flowing why make a bus lane 24/7 and stop people parking when parking would cause absolutely no harm? Do they need to be parking there at 2am? By making it 24/7 you reduce the risk of blockage because of illegally parked cars. You can introduce some physical separation to further improve compliance. You can redesign the intersections so that left turners turn left out of the general traffic lane rather than merge into the left lane prior to turning potentially holding up buses. Basically once it is permanent there is a lot more opportunity to improve the quality of the PT Corridor. I don’t see physical separation or vehicles turning out of the general lane on the 24/7 bus lanes in Auckland. What stands out to me is how pathetic the Mt Eden Road bus lanes are further to the north of the town centre. What’s going on there? What’s going on is that if AT gave the whole of Mt Eden Road bus lanes they would hit their targets for the next two years – or at least complete their targets for the last two years. How could they be aspirational from there? Maybe that suggests that km of bus lane is possibly not the best kind of target. Or that the goal should be for a lot more than the dribble of extra bus lanes that we are seeing at the moment. I think the extent to which a bus lane is continuous plays a huge role in how useful and beneficial it is. Bits and pieces of bus lanes just make it necessary for the bus driver to constantly merge back into traffic, which will probably discourage the bus driver from bothering to use the lane in the first place. Well said Groot. Merging a 17m bus into a nose-to-tail traffic jam every km defeats the whole point of bus lanes. Continuous is the way to go. Yes well said (and it’s been said many times on this blog). Even the NEX’s effectivenes is impacted by having to merge with traffic on the harbour bridge section. All the posts above is why I suggested trying bus lanes in the middle of the road with special stops such as the old tram loading zones. Melbourne uses them with its trams why couldn’t they work with buses. I can’t see what the benefit of that is. The kerb adjacent to these stops would still have to be free of parked cars otherwise disembarking passengers would have to be walking around them. All it does is pushes the stop out into the middle of the road slowing other traffic for no good reason. No 1 would be achieved by having a 30kmh speed limit and two pedestrian phases per cycle at the lights. No 2 would be achieved through a continuous bus lane and a single vehicle lane. There isn’t enough space to achieve the third priority within the road space. 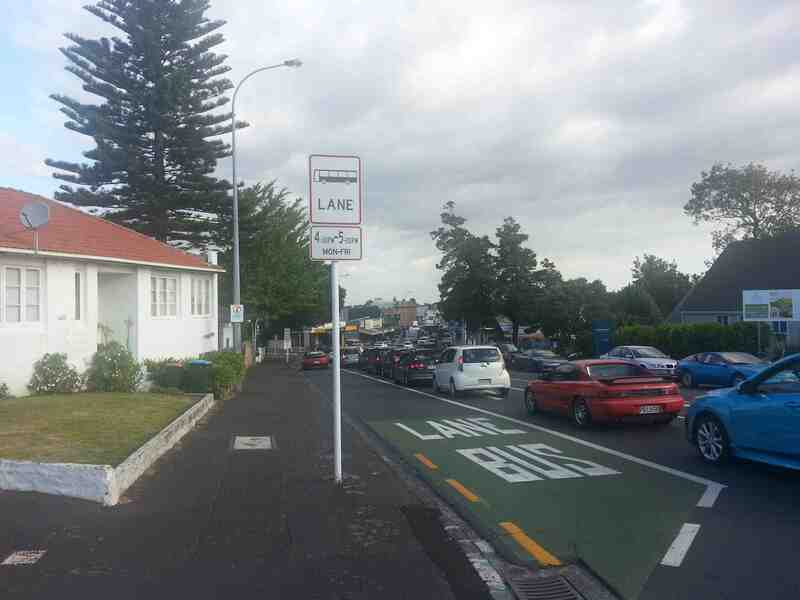 Any business that really is reliant on drive up customers should either pay for some parking on private land or move somewhere else on Mt Eden Road where there is parking. Mt Eden Rd is not in the CBD. Mt Eden Rd is not Queen Street. Mt Eden Rd is not the Viaduct. There is no need for a 30kmh speed limit or so many pedestrian phases. Getting rid of parking is a good point you make, however. Never seen a cyclist on Mt Eden Rd and I live there. The hostile street environment is the reason for low numbers of cyclists. Why do roads have to be in the CBD to have 30kmh speed limits? I don’t think the amount of private vehicle priority is needed either. It simply comes down to who is more important locals or people passing through and I think the former should always come first. Two phases per cycle is quite reasonable given there is no pedestrian crossing. John, you’ll need to shift in your speed expectation. Most roads in Auckland will have their speeds lowered when Auckland starts to follow good practice and AT’s own (new) guidelines. A pedestrian is hit every day in Auckland, and one in three is fatally or seriously injured. Then there are all the people who would walk but are put off by the environment. Let alone the cyclists. Too-high speeds and speed limits are affecting too many people. We’re going to resurrect the ability to walk and cycle around our city, and it will involve places like Mt Eden having lower speeds. John, go down to Beaumont St in the Wynyard Qtr which just had a 30m/h restriction put on it last year after becoming a very busy road for both auto and pedestrian traffic and you’ll understand why the restriction was put on. Busy roads like these with lots of pedestrians are too dangerous for higher speeds. Even now, being something new, and probably with quite a lot of drivers unaware of the change, quite a lot of them are still driving faster than 30km/h limit so actually AT needs to get over to that street and do some enforrcement. Quite frankly I’m surprised someone hasn’t been seriously hurt or injured yet. Thanks the prompt, have submitted, Alos commented on the submission that bus lanes on southern end of Mt Eden Rd need review. Morning congestion has got worse in the 10 years I have used Mt Eden Rd, and will get worse again after 3 Kings apartments are all open. With the other changes, that far end would perhaps solve itself…at least for some time? Don’t think so. Problem with the south end of Mt Eden Rd is that morning bus commute in 274 + 277 can take 10 mins stuck in car traffic (from where 274 starts at 3 Kings, to Duke / Landscape intersection), when a southern bus lane extension probably means the same trip would be 2 mins for a bus. Some bus lane improvements in Mt Eden village may mean overall faster buses and a few car drivers mode shifting, but I suspect that induced demand will fill up the southern end with cars anyway. I agree with Martin. Northbound on the Southern section of Mt Eden is completely stuffed in the mornings.